According to historical resources, as well as a rug displayed at Museum of Turkish and Islamic Arts and dated at 15th-16th Centuries, this area has been involved in carpet weaving since the first Turkish settlements in the 14th Century and became widespread in later periods. 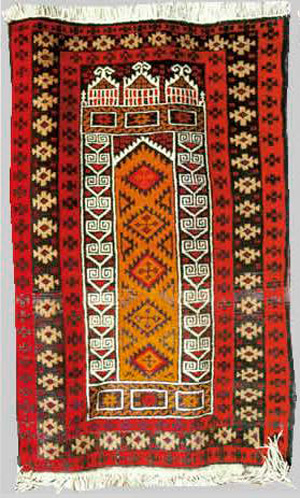 Today, these rugs are still woven within the group of Anatolian Rugs with Geometric Patterns. 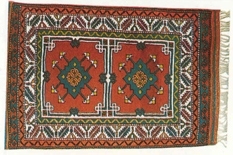 Yuntdağ rugs are produced in woollen material. The wool is obtained from sheep bred by the public themselves and span into yarn by women and children in the household. Today, ready-dyed yarn and cotton yarn are also used. Edgers and slant looms are used in the area of Yuntdağ. Warp yarns are two-ply and double, weft yarns are one-ply and single and knot yarns are two-ply and single-twist. In villages of Yuntdağ, yarns are prepared on a plane parallel to the ground. Each yarn is connected to wooden bars and to each other before being transferred to the loom. The weaving process is performed with the double-knot technique using wooden kirkit, blade and scissors. Quality: In the 20th-Century examples of Yuntdağ rugs have 30x30, 30x40, 35x45, 40x45 and 45x50 knots per 10x10 cm. Modern examples are, however, produced with 26x36 and more knots. Pile height is less than 1 cm. Quality is measured by the public by the calculation of the number of wires (threads) and siyirdim (total number of knots per line) (1). Warp yarns are counted in pairs in the area. Each yarn is called a wire (tel) and two wires (two yarns) are one siyirdim. The size of rugs depends on the number of wires. Pattern-Colour: Patterns in the area of Yuntdağ are produced either by heart or by imitating formerly woven rugs. A rug is made up of sections from the outside to the centre, namely boncuk suyu, kıyı suyu, ak su (the largest border of the rug), koltuk and göbek (inner section), which are ornamented with separate patterns. The size of the inner section (edge) of the rug varies according to the shape of the rug. The inner section is generally decorated with Mihrab or centrepieces. Rugs with mihrab can be in one track or two opposite tracks. For rugs without mihrab, the base is ornamented with pine leaves or small layers (centrepieces). Rugs woven for use on floors are referred to with such names as 'karabulut', 'develi', according to their edge borders and base ornaments. › Did you know them?